NEWS: There are changes to the Etihad Guest frequent flyer program. Gold Elite members now collect 75% tier bonus miles instead of the previous 50%, and can give out a free Etihad Guest Gold membership to anyone they choose. Etihad's frequent flyer program is called Etihad Guest. It is part of no mainsteam airline or frequent flyer alliance, but it does have links to numerous other airlines with a very complicated arrangement. Etihad Guest Tier Miles/Segments are tracked in any rolling 12 months period to measure a particular Etihad Guest Tier, or upgrade to a higher Tier. Once you have attained a tier, your status is valid for the rest of that calendar year plus one year for Silver and 2 years for Gold. In addition you will enjoy the benefits of the tier for a bonus three months. Etihad Guest is the basic level. You can earn and spend points, but there are no other perks. 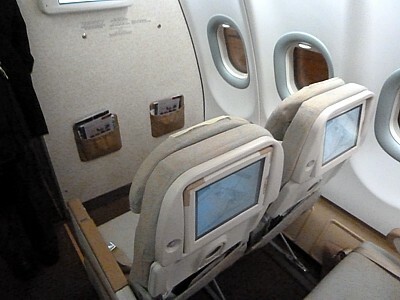 A340 Bulkead Seats Etihad Economy Class. Etihad Guest Silver can be reached after 25,000 tier miles, or travel 20 segments on Etihad (Guest Tier Segments, which are slightly different to flights). Etihad Guest Silver is better than most other Silver levels on airlines – it gives lounge access, but not much of a lounge. There is a bonus of 25% extra miles per flight flown, you get an extra 10kg of luggage allowance, and if you are in Business Class you can use the Chauffeur Service at all points throughout the journey, not just two. The best bit is that in Etihad Economy Class you can use the Pearl Business class lounge if there is one, or the (rather poor and miserable) Al Reem Lounge facility in Terminal 1 from Abu Dhabi Airport. Etihad Guest Gold can be reached after 50,000 tier miles, or travel 40 segments on Etihad (Guest Tier Segments, which are slightly different to flights). You only need 40,000 miles to maintain it each two years – for the status lasts for two years. Etihad Guest Gold gives a bonus of 50% extra miles per flight, but other than that there are few perks above Silver, other than you get an extra 15kg of luggage allowance. Lounge access is the same, with the same Al Rheem lounge. 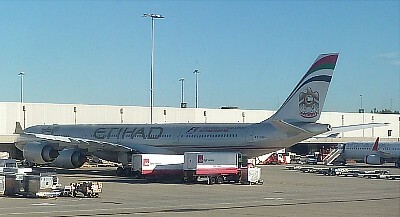 A340 at Sydney Etihad often park in the Freight Terminal. Etihad Guest Gold Elite can be reached after 125,000 tier miles, or travel 60 segments on Etihad. Etihad Guest Gold Elite is vastly better than Guest Gold – just to confuse you. There is a bonus of 75% extra miles per flight flown, you get an extra 20kg of luggage allowance. However the real perk of Etihad Guest Gold Elite level is that you get First Class perks at most airports: you can check in at the Diamond First counter, and get access to the Diamond First Class Lounge in Abu Dhabi – a real tangible benefit. Alas, if you want to invite a guest, you are shuffled off to the Pearl Business Class Lounge.